Have the the Platinum Card for close to 15 years. I am a true frequently flyer until recently and have over 500,000 MR points at present (that was after I blew 200,000 on a first class return ticket). But I have kind of retired from my job (which requires tons of weekly travels) and so now I chill out and do not fly. Keeping the Platinum card was out of the question with the annual fee. Luckily, Amex came out with this card where I can still earn MR points (might as well since I have so much sticking around) but do not have to pay any annual fee. I give this a 4-star rather than 5 since I think the "preferred" version is slightly better. But I'll take the no annual fee version any day. For those who are not Amex holders, I can say that their customer service is the best. And I have had all other "premier" cards from Chase, Citi, BOA, Barclays. Their cards may be good, but customer service cannot compare (especially when it comes to fraudulent charges where Amex goes to bat for you vs the others). 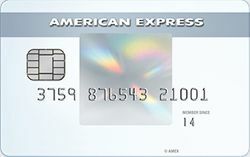 I have always wanted to get an Amex card and was considering either the BCE or Everyday. It was really a difference between earning points or cash. In the end, I settled for this card and if not for the fact that there is no annual fee, I would chosen the BCE cos if I wanted to earn points (before this card), I would have to get the Amex Green. I also went to the pre-approval site and these 2 cards showed up. Approval was instant and after 8 months, I had a CLI and now my limit is $6000. I had one fraudulent charge on my account and Amex just took care of it. App is also pretty good. I am a rebuilder who has had his share of high fee harvester subprime cards. When my score finally reached the mid to high 600 area, I decided that it was time to get some proper no annual fee credit card from a regular reputable issuer. I had a Macy's card but did not want to get another store card because I could only in the store and I am on a tight budget and I need a card that I could use at regular places like supermarkets and gas stations etc. I decided to check out the Amex pre-approval site and I was actually shown this card. I was approved for $500 and 3 months later, my credit line got increased to $3000! As a reference, here are my stats: TU-678, EX 645, EQ-660 - average about 661. Two collections 5 years old (probably about to drop off). One auto loan - $13,000 and a student loan - $10,000. Have been current on every payment for the last 2 years. I applied for this card and was instantly approved with a starting limit of $13,000. I also got the 0% for 15 months which I took advantage of. After paying off the initial balance transfer, I started using this card more often and it is now my goto card. I hit 20 transactions a month pretty easily and I do get the 20% bonus points. I got this card because in my opinion, this is the best card for me because I want to earn Membership Reward points but am not a particularly high spender. I am single and perhaps put $30,000 on the card a year. The big plus is that there is no annual fee. This is how I mostly use my points. I live in a AA hub. So I normally transfer points to BA Avios and use it for AA flights since my flights are short haul and Avios rewards are distance based. There are a few times a year where you get bonuses for transferring to Avios and I always take full advantage of that. I would say that if you are not a high spender, do not churn and burn cards for sign up bonuses but want a no annual fee rewards card that can transfer to airline partners, this is the only card to get. As a background, I live and work in the city and am single. I travel too and want to earn reward points where I can transfer to airlines. A lot of my friends have either the Amex Platinum or the Chase Sapphire Reserve or Preferred and told me how great those cards were. I could never get myself to pay those annual fees. Being a single, my grocery bills aren't that high and I do not drive. I also use my company's corporate Amex card to pay for my business class tickets for international travel. I also have to T&E all business expenses through the card. So for me, this card is perfectly ideal since I can earn extra MR points from my own personal spending without blowing a hole in my pocket with annual fees. The $13k limit I got is more than enough for me. I got this card for the 0% balance transfer deal. I was approved but only with a $1000 credit limit. That was not enough to do the balance transfer that I wanted. I called customer service and was told that I could potentially get a credit line increase in 60 days. After 60 days, I did get an increase to $3000 but the deal had expired! What a sham! Did not expect this from Amex. I applied for this card because I wanted an Amex and also to earn MR points. Furthermore, this card has no annual fees. My starting limit was $5000. After 9 months of paying in full and on time (with an average balance of $1000), I got a credit line increase to $9000. This is a great card and Amex is a great company. I lost my card once and a replacement was sent the next day. I had fraudulent charges twice and Amex took care of it. In this aspect, Amex is so much better than Visa. The app is also fantastic to use. This is my first card since I graduated from college. I did not really build my credit profile in college until my senior year where I got a Discover it card for student. My score is right about 700. My starting limit is $3000 which I guess is ok for a first real credit card since school. I now have a Discover, Amex and probably need to get a Visa for places where Amex does not work. This is the my first real unsecured card as a rebuilder. Two years ago, I had my car repossessed and also two medical bills that went into collections. My credit score dropped from the high 700s into the 500 area. To rebuild my credit, I had to get a couple of secured cards - I got the Capital One Secured and Opensky. In fact, these were the only 2 cards I had for the last 2 years until I got a Target card ($500 limit). Even though I had 2 collections and lost my car, I have been current on all my other bills (credit card, mortgage and student loans). I have always wanted to get an Amex so after looking at their site and fiddling with the pre-approval page, this card popped up. I applied and was approved for $2000 in credit limits. After 90 days, I asked for a CLI and it was increased to $5000. After rebuilding for year and a half, I thought it was time to get a regular no annual fee unsecured credit card. There were many cards I considered including Capital One, Chase, Citi and obviously Amex. I then decided to just use the pre-approval sites for these and see what was potentially available. Amex came up with this card and after thinking about it for a while, I decided to pull the trigger since I always wanted an Amex. I think the card will fit me just fine. It has no annual fee and I can earn reward points. I am not really too bothered about meeting the 20 transaction a month thing to get extra bonus points because my spending is so low anyway. Anyway, after I applied, I was approved instantly and given a $1000 and 0% apr for 12 months. I have never had a Amex card and decided that I wanted to get my foot in the door with them. After reading tons of blogs about their reward points, I decided I would rather earn points rather than cash rewards. So I decided it was between the Everyday and the Premier Rewards Gold. Then I decided that I should just get both. So I applied for both at the same time and was approved for both!! My starting limit for the Everyday was $2000. After 6 months, they bumped it up to $7000. I love Amex and I use mainly these 2 cards. The app and website are super easy to use and I manage both my cards from my app most of the time. I have a relatively thin credit profile as I do not have a long history or have many cards. My EX score was about 680 when I applied and I was initially approved for $1500. Upon activation, my limit was increased to $8000. This is my Amex card and I really like it. The website and app are all very easy to use. I am not exactly a big spender so I will not be racking up tons of MR points. But there is no annual fee, so no pressure for getting "value" out of the card! I have decided to downgrade my PRG to this card. I actually did not downgrade but actually got this card first before cancelling the the PRG. I might loss out a little on groceries because of the cap, but I will save a lot on annual fee. The $100 airline credit on the PRG is useless to me because I fly all domestic airlines during the year and with Amex, you actually have to pick one particular airline. With most airlines giving you points based on status anyway, I don't really miss the 3X on airlines. This is the best MR card Amex has come out with for both folks who fly but cannot be bothered to "max out" MR earnings or those who simple do not spend a lot and cannot justify the annual fees. I bet they will be losing a lot of charge cards to this card. This is the first ever Amex card that I got. And my credit score was about 643 when I was approved. The starting limit was low at $500. But after 5 months of regular use and paying in full and on time, I got a CLI up to $2000. I have also since gotten a PRG and I love Amex. Their app is easy to use. When I log into my account, my two cards are on the screen and if I click one, I can see all the details and how many reward points I have. As far as spending goes, I hit the 20 transactions a month most of the time. I definitely put my grocery spending on the ED and my gas spending on the PRG. I think that if you want to earn MR points, this is the card to start of with because there is no annual fee. You do have to meet the 20 transactions a month criteria to get the 20% bonus points. But if you focus mainly on using this card as your main card, 20 transactions a month should not be a problem. I find that I still have to use my Visa once in a while since not all places accept Amex. This is clearly a deliberate strategy by Amex. They want you to use only this card and it makes combining card to "max out points" harder. For years, I have been combining cards and trying to max our MR points. But with airlines going towards rewarding your based on the tickets you spend and your status, I think a card like this makes more sense for most people who want to earn reward points. I have had "travel cards with annual fees" for over 15 years and I just can't believe how much annual fees I have spent! I was considering either the ED or the EDP. When I looked at my past statements, I am came to the conclusion that it would be a piece of cake for me to hit the 20 transactions a month criteria than the 30 transactions a month for the Preferred version. Since I travel, my grocery spending is lower than a typical family so the $6,000 cap does not bother me. I also do not spend as much on gas because I am in the air most of the time. I used to have the PRG but the annual fee was too much (IMO). I never considered the airline credit a perk because all you are doing is pre-paying for what you would be paying anyway. I have to use my company card for travel but since it is an Amex, I still get points. So for me, this card is absolutely great and works out for me just fine. I was mulling over whether to apply for Amex or not for over a month. I finally decided to pull the trigger. My score was around 672 when I applied. I was approved instantly and my starting credit limit was $1000. I hop and am confidant that they limit will increase over time. At the time of application, I had a Capital One Secured Mastercard, a Sears store card ($600 limit) and a Target card ($500). My score was below 500 just 2 years ago and it sure took a lot of effort to rebuild. But I am very happy that I have gotten my foot into Amex. I have been reading all about earning points and getting free airline tickets and can only dream when I have earned enough points for that. One thing I noticed is that I really like Amex web and app. They are very intuitive and easy to use. So far, the card has been great. I have had the Amex Green for the longest time. It is the only card I used unless Amex is not accepted at the store. My son has been encouraging me to get better cards like the Gold, Platinum but I just could not be bothered. I started reading some of these blogs and sometimes just jealous when I see 50k or 100k points bonus for signing up for a new card. I just could not be bothered because you have to pay annual fees on most of these cards and having to manage many cards would be too much of a hassle. But when this card came out, I knew I had to take a serious look at it. It allows you to earn membership reward points and it has no annual fee. You also get 2 points for every dollar you spend at US supermarkets. It is definitely better than the Amex Green that I have. I also got a sign up bonus as well (back in those days, there was no such thing). I am a rebuilder and my score was 640 TU when I applied. I was mulling over whether to apply or not. I had one medical bill in collections 3 years ago and my score tanked 200 points. I went to the Amex site and clicked check my offers and it showed that I was "pre-approved" for the Everyday card with no annual fee. I was approved with a $1000 limit with an option for a CLI after 60 days. After the 60 days, I called to request a CLI and got it bumped up to $3000. I have a 810 FICO score and applied for this card to take advantage of the 0% for 15 months balance transfer. I wanted to transfer over $10000 from another card. I only got a starting credit line of $5,000 which meant I could only transfer over $3,500 (75% of $5000). This is such a joke because all my other cards give me at least $20,000 credit lines and my utilization ratio is less than 10%. This is really so ridiculous. Would advice anyone to stay away from this card. You'll get a ridiculously small credit line (for your score). This is my first Amex card and I was going back and forth between the Blue Cash Everyday vs the Everyday card. At the end of the day, I decided to go with points over cash back. I got 0% for 12 months (which is sweet). My initial credit limit was $1,500 but within 6 months, they had tripled that to $4,500. It is still not that large but more than enough for me. I do not spend a lot on things like groceries and gas, which was why I never considered the "preferred version". Since this is my main card, I never had any problems reaching 20 transactions a month and so I do earn the 20% bonus points. I have also met the spending requirements and got my 10,000 bonus points. I applied for this card mainly because of the 0% deal for 15 months which I got. Approved for $15,000. Yah! Then found out that I could only transfer $7,500! It said the lesser of $7,500 or 15% of credit limits (which would have been $11,250). This is really sneaky of Amex. Having said that, this is still a good card because you could earn Membership Reward points which are transferable to airline partners on a card with no annual fee. No other issuer has such a card. I use it as my main card now unless Amex is not accepted. Meeting the 20 transactions a month is not a problem for me. I already have the old Amex Blue Cash Everyday card and wanted to start earning MR points. When this card came out, I decided I had to go for it since there was no annual fee. I went to the pre-approval site and lo and behold, I was "pre-approved" for this! Here were the terms I got. 15,000 sign up bonus after $1000 of spending within 3 months. 20% bonus if you have 20 transactions every month. Since I switched my spending from the Blue Cash to the Everyday, I had no problem hitting the 20 transactions a month criteria. I got the Green Card before and have since ditched it after I got this card. I get to earn 2X on US supermarkets (until $6000) whereas the Green Card was 1X on everything. Plus, it has no annual fee whereas I had to pay $95 for the annual fee on the Green. Since, this is my main card, I really have no problems meeting the 20 transactions per month criteria to earn the extra 20% bonus. I go to the supermarket twice a week (that means 8 times a month), CVS and Rite Aid about 6 times a month as well. I have autopay on my auto insurance, netflix, utilities, water. Then a few more time eating out and other purchases round it up. I have been rebuilding my credit for the last 2 years and I was really surprised that I was actually approved for this card. Here is my background. I have 10 medical bills in collections (yep - 10). But I am current on all my other bills. I started rebuilding with secured cards like Opensky, Capital One secured. Then I got a couple of unsecured cards like Credit One and Fingerhut. I soon managed to get 3 store cards. All of these cards had really low limits. I have been fiddling with pre-approval sites once in a while and in this instance, a few Amex cards popped up. I was torn between the blue cash everyday and the everyday card but decided to go with this. I apped and was actually instantly approved (for once). My starting limit was low but was it said that I could be eligible for a credit line increase after 5 months. I am glad I got into the Amex family and really hope my limit goes up over time. I applied for this card because Amex has finally introduced a no-annual fee credit card that let's you earn Membership Rewards points that can be transferred to airline partners. I used to have the Gold card but canceled it after I got this card because I did not want to pay the annual fee. You do have to make 20 transactions a month to get the extra 20% bonus points. But I have no problems meeting that requirement. My card also came with a 0% balance transfer deal for 15 months with no balance transfer fee. Since I did not carry any balance on my previous cards, that was irrelevant for me. I have had the Platinum card for the longest time and when I stopped traveling, the card was no longer as useful to me. I actually downgraded to the Green Card because that was the card with the lowest fee that earned MR points. When this card came out, I knew I had to get it. There was a 25,000 sign up bonus floating around and I got approved. Once the account was linked to my MR account, I canceled the Green card. The Green card had $95 annual fee and you earned only 1X for everything. With the Everyday card, you earn 2X on supermarket spending (up to $6000 a year) and 1X on everything else. If you have 20 transactions a month, you get get 20% bonus points. That means on supermarket spending, you get 2.4X and 1.2X on regular spending. Since this card has no annual fee, it is a no-brainer vs the Green card that I had. There is also an annual fee version where you can earn more points. However, I do not want to pay any annual fee so this card works out perfectly. My credit karma score was around 650 and I was told I had a "fair" chance of getting this card. So I applied and was approved for a version which had no sign up bonus or 0% intro deal like you see on their website. My SCL was $1000. It was a hard inquiry so I decided to accept the offer since the regular sign up bonus was not huge either. Terms said I could request a credit line increase after 5 months. We'll see how that goes.